would Du want to help WWF? Die Fanauswahl: of course yes!! Die Fanauswahl: Yes! Hunting is wrong. Have Du heard about Build a bär supporting the WWF? Do Du believe that Tiere should be superior to humans? For Mehr than 45 years, WWF has been protecting the future of nature. The largest multinational conservation organization in the world, WWF works in 100 countries and is supported Von 1.2 million members in the United States and close to 5 million globally. WWF's unique way of working combines global reach with a foundation in science, involves action at every level from local to global, and ensures the delivery of innovative solutions that meet the needs of both people and nature. The good news about nature is that it is Wird angezeigt signs of repair and renewal in thousands of small and large protected areas all over India. 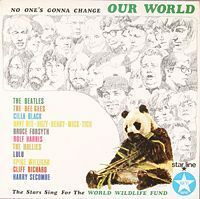 No One's Gonna Change Our World is a charity album released in the UK on ___________ for the benefit of the World Wildlife Fund.